Always wanted a big wheel gun!! Now I finally have one!! It’s the Smith I wanted at a good price. I also appreciate your no nonsense approach to credit cards and your shipping. 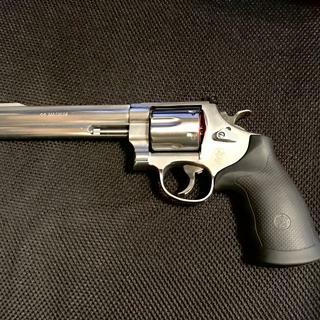 Always wanted a 44mag. Got an email with a good price, and I went for it. Childhood dream gun. Excellent price! because the brand is good ..
Never had a big revolver. I do now! Love this gun. As advertised. Great place to get a gun with low prices. Absolutely fantastic experience using grabagun.com. After searching several gun stores in-person, this was the best price that I found for the purchase price. The process for ordering, tracking the order, and picking up at the store of your choosing was extremely simple. Very satisfied with the purchase (and shooting this gun is great too). I am glad I went with the 6.5" barrel. I had a friend of mine who I shoot quite a bit with give me a hard time about not having any revolvers in my collection. After a couple of years of hearing that from him I finally purchased a S&W 500. I loved that gun so much I went on to buy the 629 classic and just recently the 686 plus. All three of these S&W revolvers are very well build revolvers and are just a joy to shoot and look at. I still like my tupperware guns but I have a new found appreciation for these well built S&W revolvers. If you don't have one it surly should be on your list of firearms to add to you collection. I have wanted a wheel gun for a long time and finally bought one. GAG had it for a very good price and their shipping was fast too. I love how the gun feels in my hand and it is a very good shooter. The recoil depends on the ammo you use. You can shoot a light load and be about like a 45. Or you can use the 300 gain for hunting or home defense and it will be kind of a kicker. With the full underlug barrel this length seems perfect to me. It's nicely balanced with just a slightly nose heavy feel.....perfect for target work. I did swap out the grip for a Hogue as they fit my larger hands better. This is my first 44 mag and I can't believe how much fun they are to shoot. This is a great gun. I know there are a lot of negatives about S&W and the new locks, but most even routine complaints are on smaller frame guns. Never had any issues for myself, and while I think it looks a little ugly, it could be removed if you really hated it. Other than that, this gun is awesome. The trigger in SA operation is like butter. Balance is a little front heavy, but it makes those .44 Mag hot loads calm right down on kick. 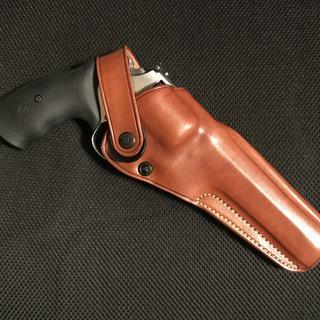 I am still trying to get it to fit nicely in my IWB (Inside Waist Band) concealed carry holster...just kidding. I got a pretty nice leather belt and 45LC holster that fits it real nice as well as a black under the arm cross draw holster. 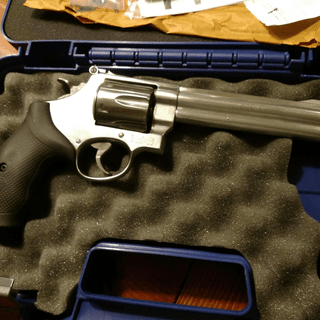 Not quite as nice and light as my 4" GP100 .357, but not nearly as heavy as my Taurus Raging Judge Magnum 6.5" either. Grin.